The RollerAid is a modern solution for the crutch and is ideal for individuals who are recovering from foot surgery, breaks, sprains, amputations and ulcers of the foot. This innovative and stylish crutch substitute can be easily adjusted without tools to meet your needs allowing for increased maneuverability. 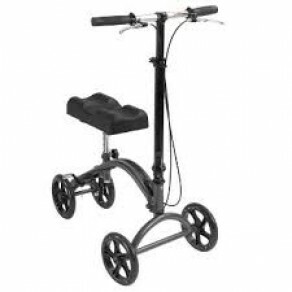 This knee walker comes standard with tool free height adjustable dual hand brakes ensuring optimal safety and security when in use. The extra thick leg pad can be height adjusted and is channeled to provide increased stability allowing for a pain free comfortable experience.